How do you use your local park? Maybe you jog around it or walk the dog through it. Maybe your children have fun in the playground or it's a place where you have picnics with friends in the summer. Parks keep us healthy, both physically and mentally. They are fantastic green spaces that communities share. Right now, the government is making drastic, unnecessary cuts that are damaging people’s lives. 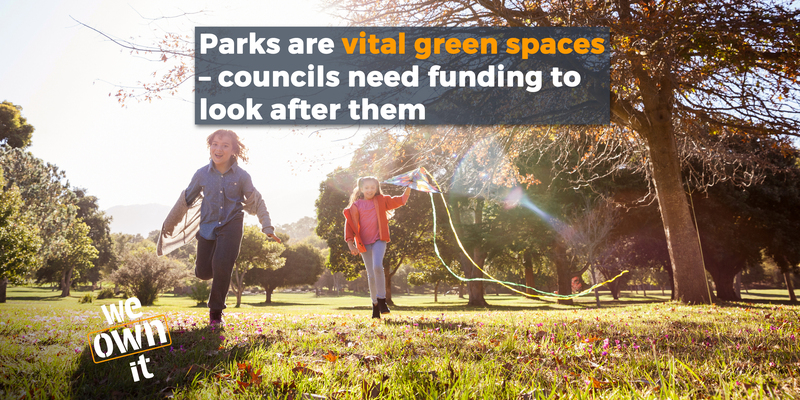 Our precious parks are competing with other public services for squeezed council funding. Because of this pressure, councils are looking at options for selling off bits of land, outsourcing parks management and making money by allowing private companies to rent out the space. Parks help us breathe and reboot. We have enough money for them - they should be properly funded and run for people not profit. Britain’s public parks are over 175 years old. 30,000 local residents sent a petition to Queen Victoria calling for a park – and the Victoria ‘’People’s Park” in London was created. So our very first park was a campaign victory for people power! Today there are around 27,000 public parks across the country, used by 37 million people every year. Public parks provide essential green open spaces for local communities. We need them. Heritage Lottery Fund research shows that more people are using parks and 79% of the public support investing in them - but cuts mean parks are suffering from 'decline and neglect'. Council budgets have been drastically cut - and many councils are choosing to spend their budgets on other services. Parks are amazing, but councils don’t have a statutory duty to provide them. In 2016, 92% of parks managers reported cuts to their budgets over the last three years and 95% expected cuts to continue. Fewer staff and resources make it difficult to maintain parks in good condition. This also means less support for park volunteers and community groups. Burnley is committed to keeping its parks public - but like many councils, cuts mean that it must increasingly rely on volunteers to help manage its parks. "A slide towards privately-run parks"? Councils are scrabbling around to come up with solutions – and privatisation is creeping in as an option. Some councils have already begun selling off bits of their parks for development. In the last three years, around 10 parks have been partially (or in one case wholly) sold off. Heritage Lottery Fund research from 2016 suggests 9% of parks managers are considering selling off whole parks or parts of parks in the next three years. London Councils has warned of a 'slide towards privately-run parks' by 2020 if government cuts continue. In 2015 the city’s mayor announced plans to sell Sefton Park Meadows, an 11-acre green space, to a house-builder. Protests were also sparked in the area as the park hosted a two-day Formula E race. Problems with noise, disruption and damage eventually led to the organisers agreeing to withdraw. For many years, the city council has held fairs and circuses at Ryelands Park. Last year, however, increasingly super-sized and extended events were reported, causing damage to the park and disruption to locals. Campaigners presented a 700 signature petition to their local council, arguing that they had breached a licence agreement signed in 2005 which had been retrospectively changed. MPs launched an inquiry in 2016 on the future of public parks. In response, we carried out polling which showed that 70% believe privatising parks is unacceptable and 75% want councils to have a legal duty to protect public parks. The public supports well-funded parks that belong to all of us. Parks make our lives greener and happier - we need to protect them for the future. Join your local Friends of Parks group to help defend your park against cuts and privatisation. Find out more at the National Federation of Parks and Green Spaces. You can also support this wonderful group of homeowners who have been struggling with land management companies and are trying to get their local parks brought in-house. Sign their petition here.